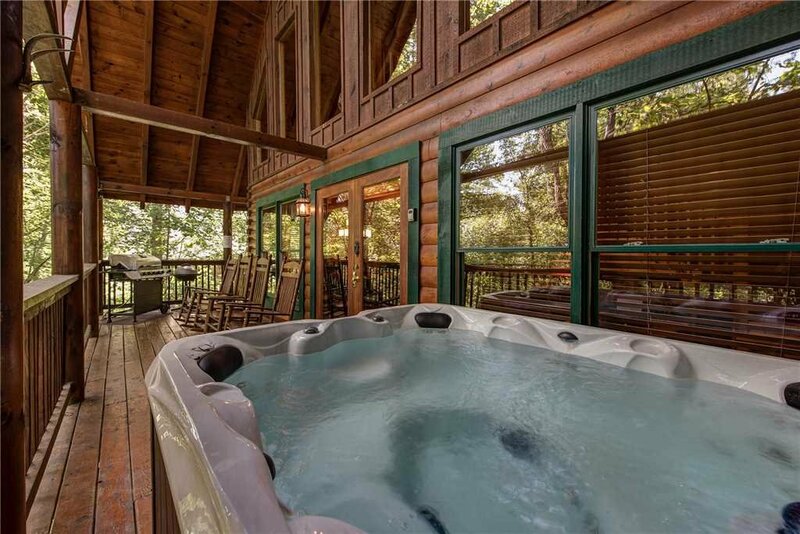 We have 4 bedrooms, 3 fireplaces, 2 huge decks, and a hot tub with a gorgeous view! 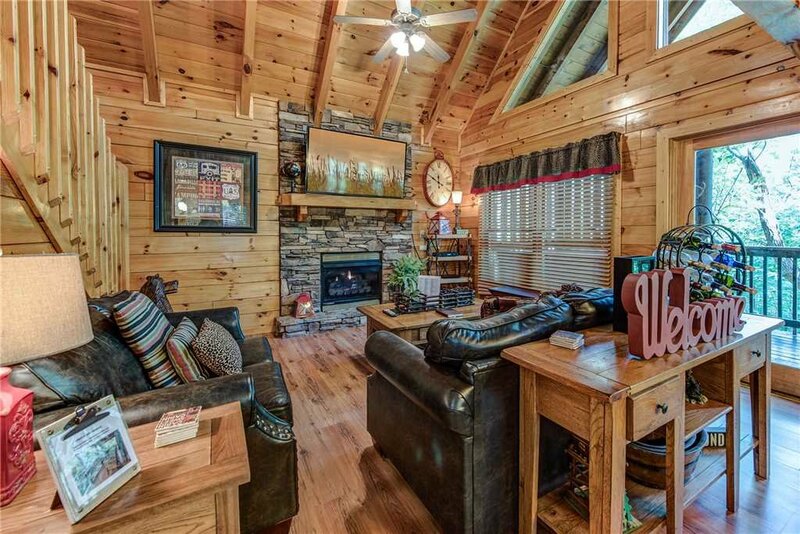 Holly Berry, a 3-story log cabin that can sleep up to 13 people—and a pet or 2 as well. 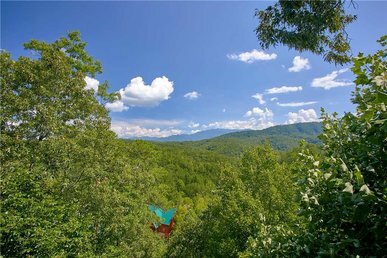 Located in the gated Sherwood Forest Resort, Holly Berry is close to all of the area’s must-visit attractions, from Dollywood to the Titanic Museum to the Great Smoky Mountains National Park. The resort itself, nestled on a ridge, includes an outdoor swimming pool you can use for free in the summer. 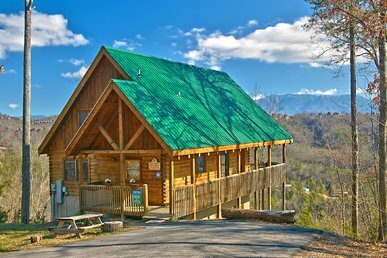 And year-round you can stroll along its walkways, admiring the lush woodlands and the views of the Smoky Mountains. 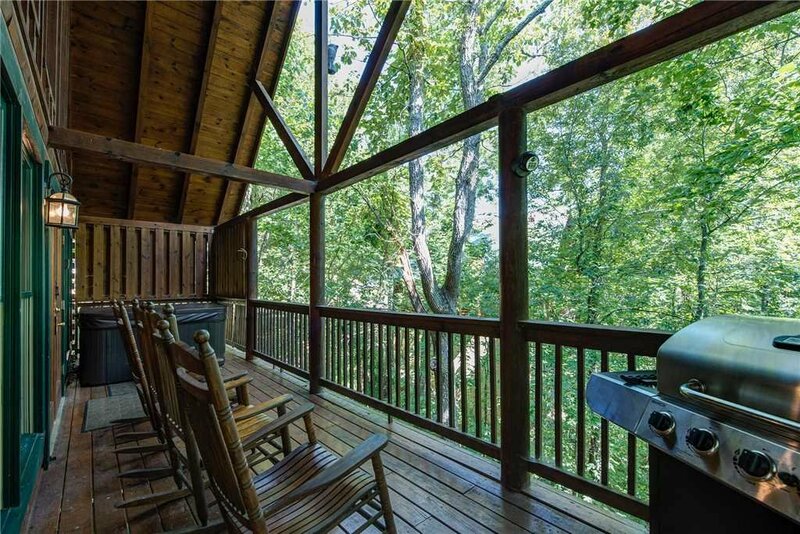 You can savor the sights and sounds of the Smokies from the cabin as well, particularly from its covered decks. 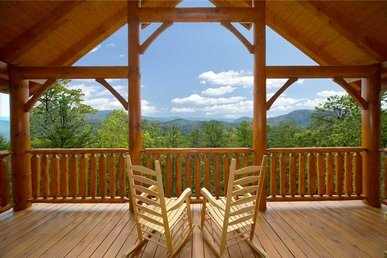 Enjoy breakfast at the patio table as songbirds greet the day; sip cocktails on the rocking chairs as the sunset bathes the sky in a kaleidoscope of color; cook kabobs on the gas grill as the mountain breeze whispers through the trees. 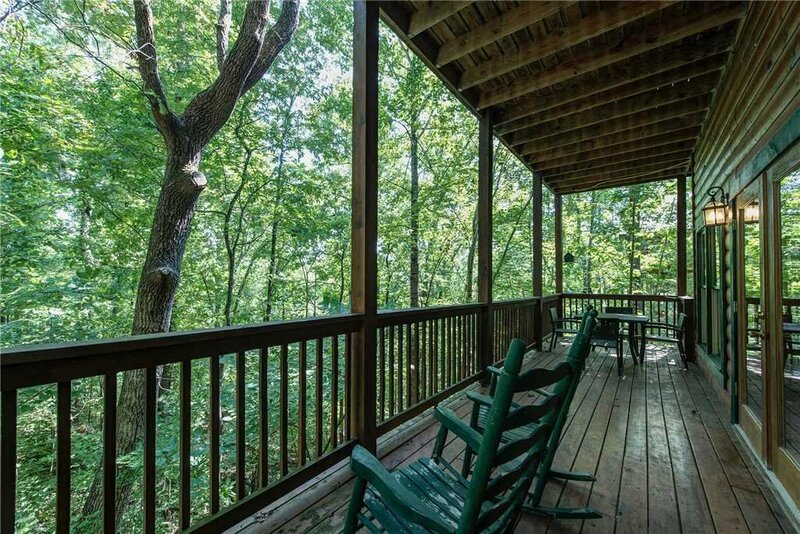 And perhaps best of all, listen to owls, whip-poor-wills, and tree frogs while luxuriating in the deck’s hot tub late at night. Holly Berry is no less enchanting inside. 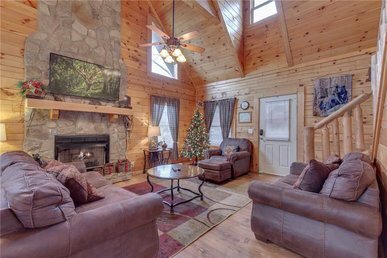 Wood-planked walls and floors, a beamed cathedral ceiling, large windows, and classic furnishings invite you to kick off your shoes, settle in, and make yourself at home. 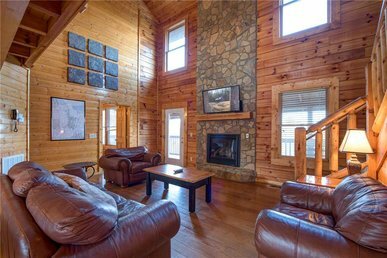 Both the main floor’s living room and the downstairs den feature fireplaces for cozying up to in winter, large flat-panel TVs, and leather sofas you’ll love sinking into. 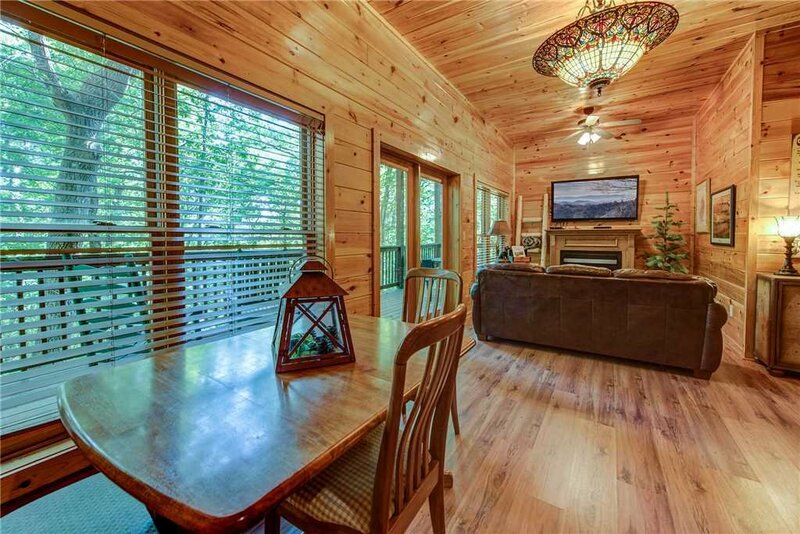 Eight people can sit at the main floor’s dining table, and another 2 can sidle up to the adjacent breakfast bar. 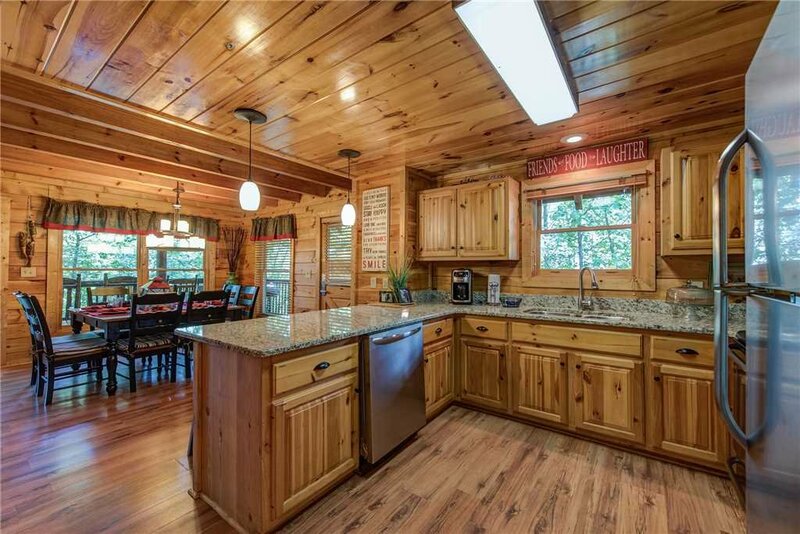 A breakfast bar is also a handy place for friends or family to help prepare a meal—and once you see Holly Berry’s open, well-equipped kitchen, you’ll likely want to dine in at least some of the time. 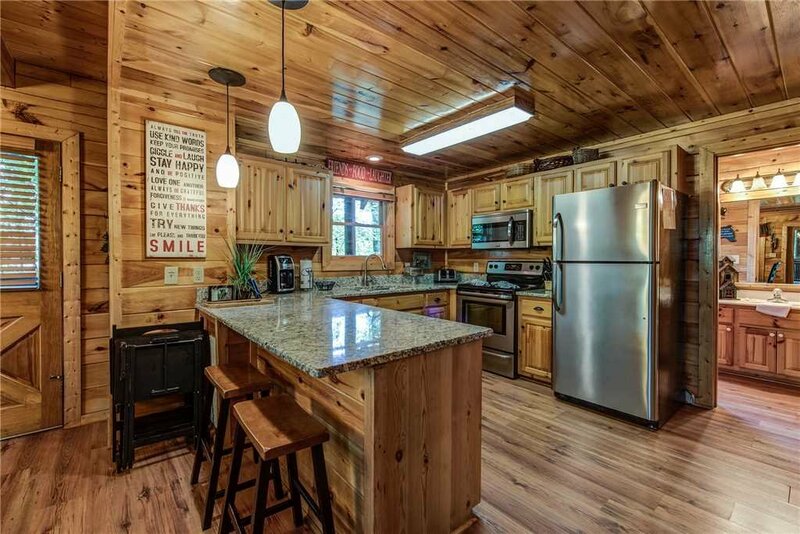 Stainless-steel appliances, gadgets, cookware, tableware, gleaming counters: The kitchen has it all. There’s even a dishwasher because nobody wants to scrub plates while on vacation. 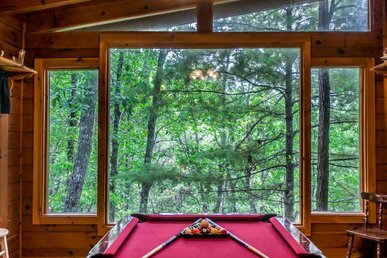 After dinner, if you’re not relaxing on the deck, watching a favorite TV show, surfing the web, or lazing in the hot tub, head upstairs to shoot some pool on the full-size billiard table. 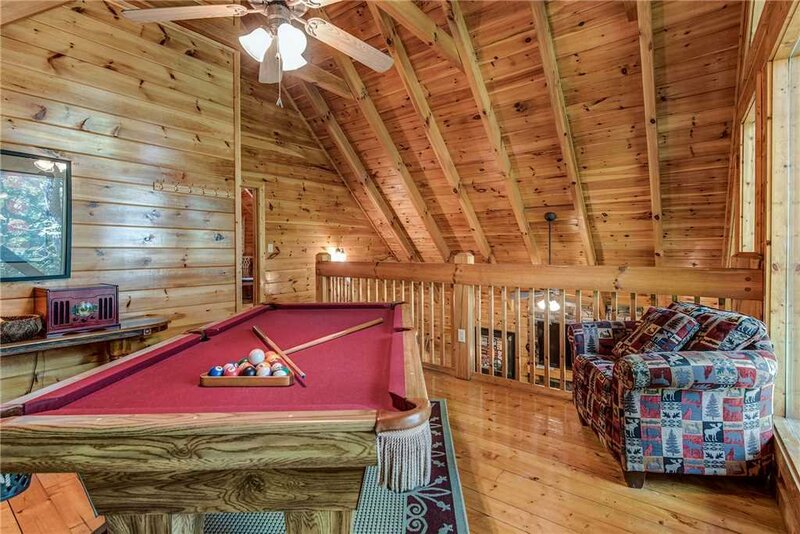 Even if you don’t play, you might want to head up there—the views are stunning. In fact, they just might distract you from your game! 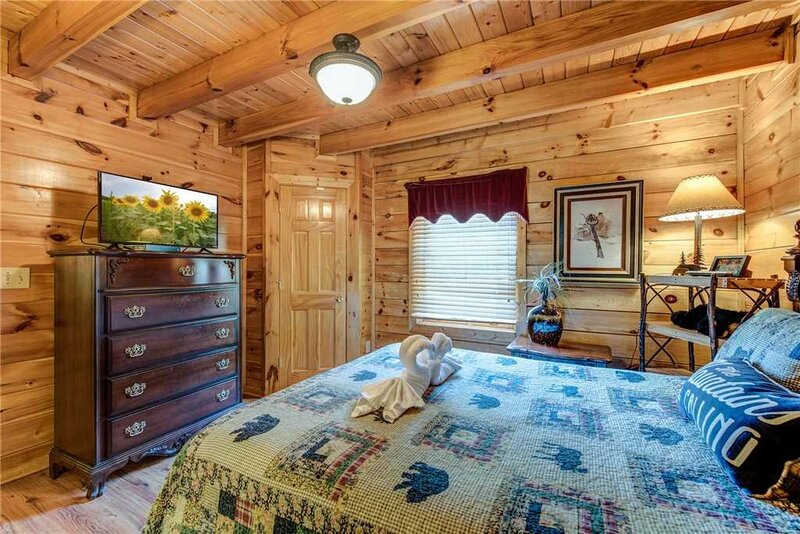 Upstairs is also home to the master suite. 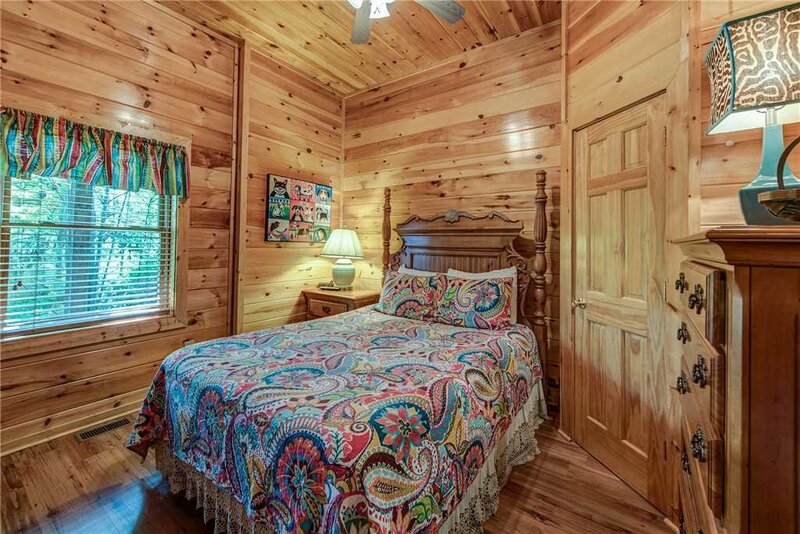 This spacious bedroom is reason enough to stay at Holly Berry. 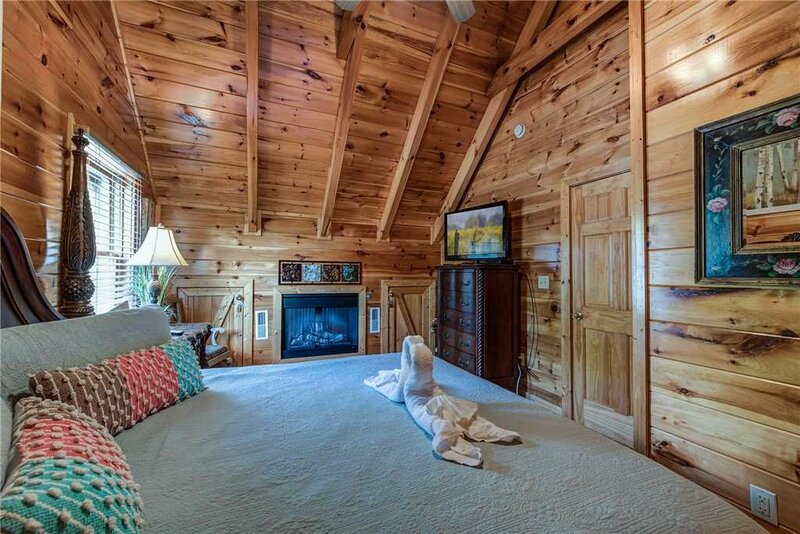 Along with a king-size bed, a flat-screen TV, and a private bathroom, it includes both a fireplace and a jetted tub. 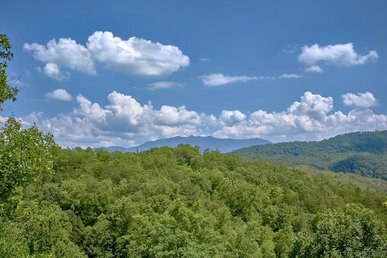 We won’t blame you for wanting to spend hours up here. 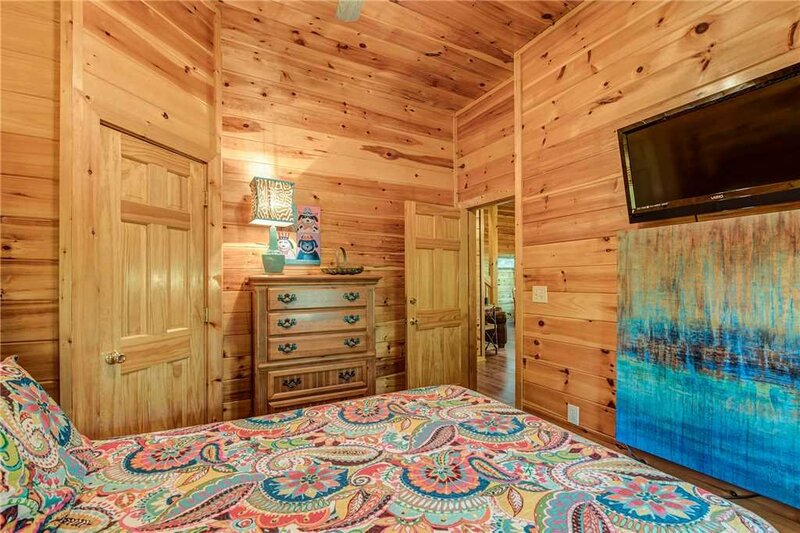 The 2nd bedroom, on the main level, includes a comfortable queen-size bed and a flat-screen TV, as does one of the downstairs bedrooms. 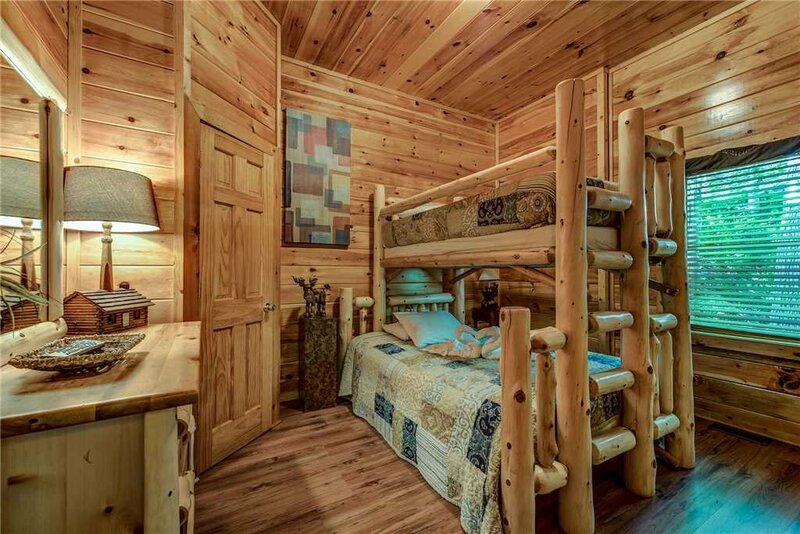 The 4th bedroom, also downstairs, is perfect for the kids in your group: It features a twin bunk bed over a full-size bed so that 3 people can make it their private clubhouse. What’s more, sofas in the living room and the den convert into beds for 2, should you have additional guests. 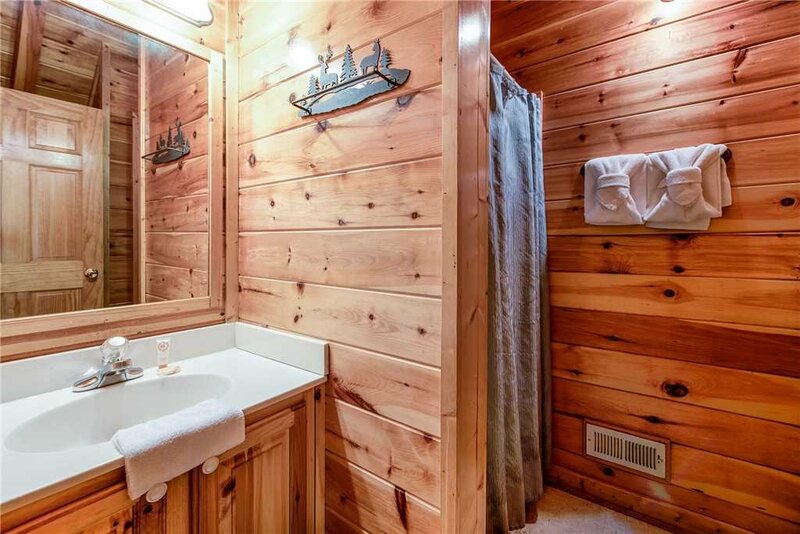 A full bathroom is located on each floor, which will make everyone’s morning routine much less hectic. Holly Berry’s other amenities include a washer and dryer (for once you can return from vacation with a suitcase full of clean clothes! 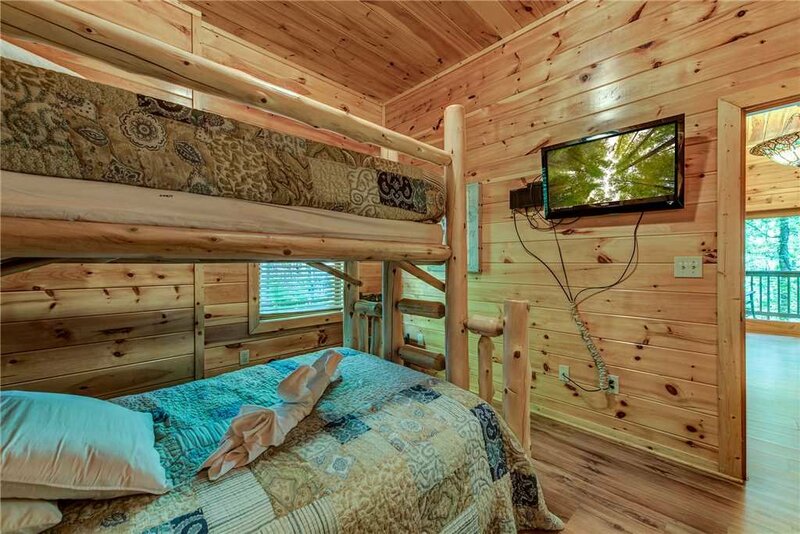 ), free WiFi, and cable TV. 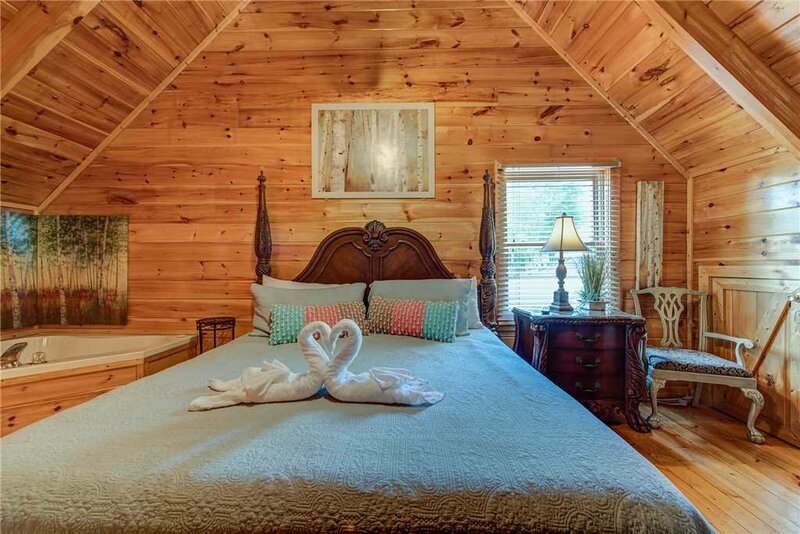 You’ll find the beds perfectly made up when you arrive, along with plenty of clean towels and extra bedding—no need to bring your own. 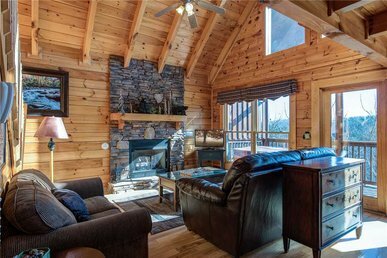 When you stay at Holly Berry, the living is easy… as it should be when you’re on vacation. So make your reservation today, before someone else beats you to it. We’re looking forward to seeing you! 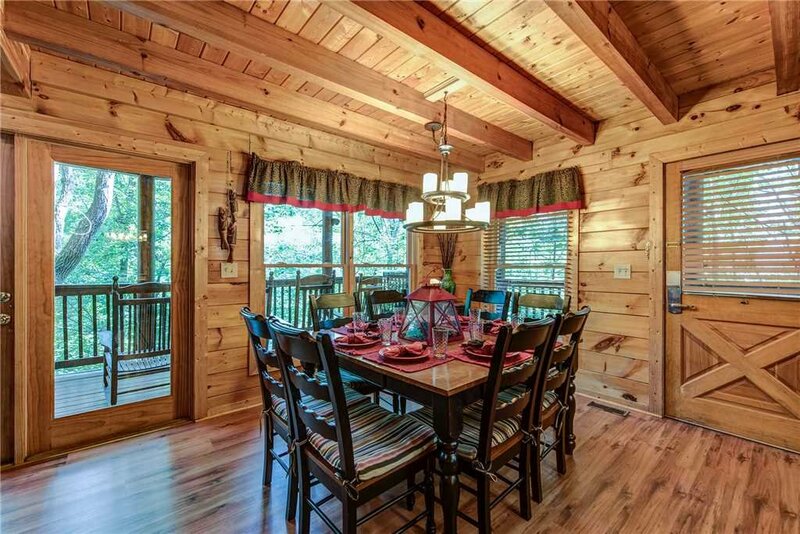 We had a great time, the weather was perfect and the cabin was beautiful. Thanks for your positive comments and rating. We are happy to hear that you enjoyed your recent stay. Come back soon! 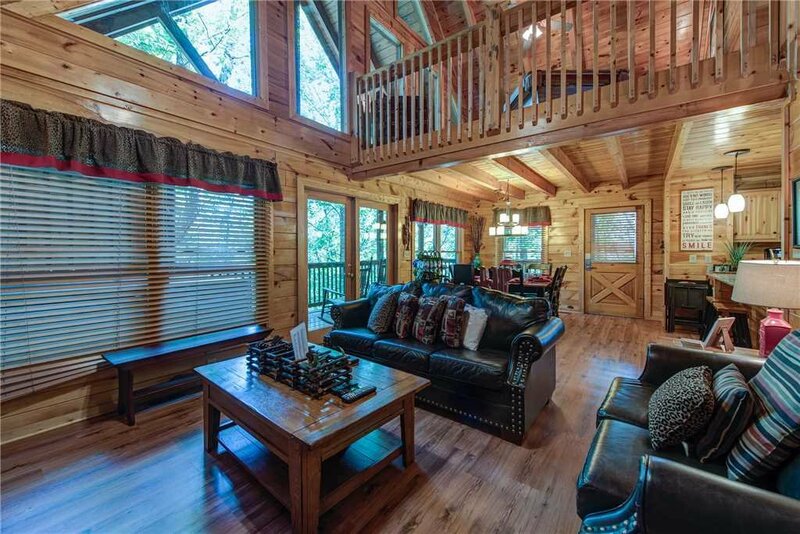 Beautiful cabin and great time! 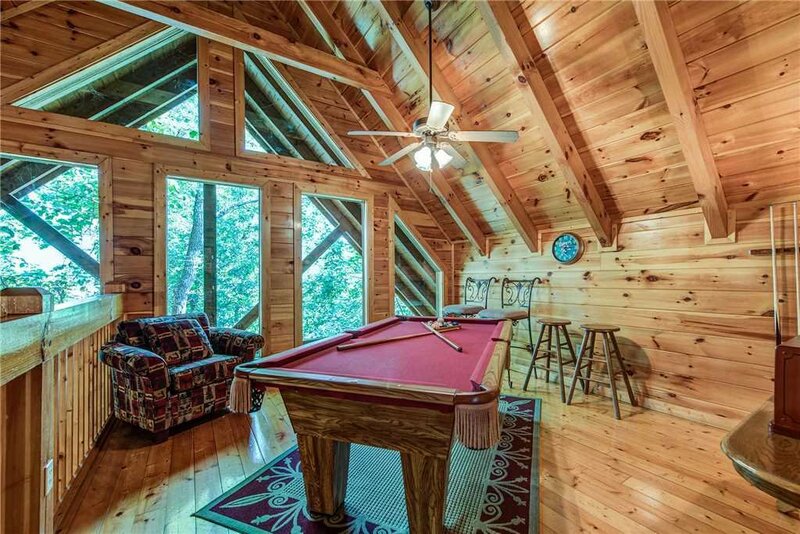 Loved the cabin over all. Beautiful and well stocked. The only downside was dirty floors. It would turn our feet and socks black when walking around. Thanks for your review of Holly Berry and for choosing us on your recent trip to the area. We have addressed the cleaning comment and will ensure that the floors are steam mopped. Come back soon! I am happy to hear that you enjoyed your recent stay at Holly Berry! That is really neat that you had the chance to gather together with family members and share memories of your Mother. We hope to have you again in the near future! 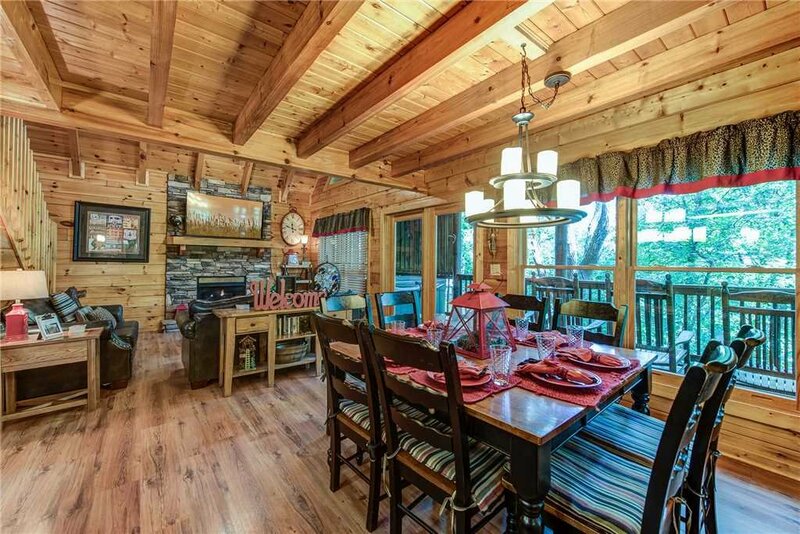 Holly Berry was a wonderful cabin for our annual girls trip. Plenty of room! Thanks for the positive comments and four-star rating - we were happy to host you and your group and glad to hear that you enjoyed your stay. Come back soon! 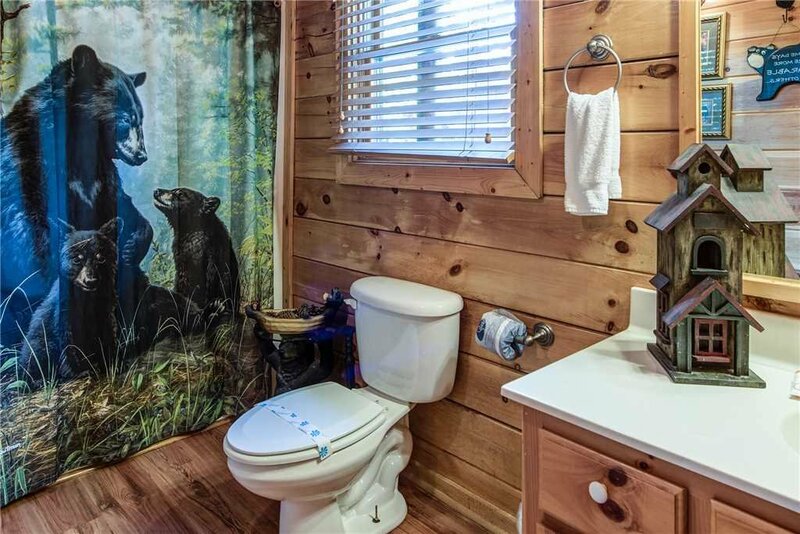 The cabin was not what we are used to in a rental. The whole cabin could use a thorough cleaning, I made the mistake of walking around in my bare feet and the floors were filthy. There has been something spilled on the main floor living room furniture that smells like a combination of sour wine/beer or wet dog. Finally had to just sit at the dining table. 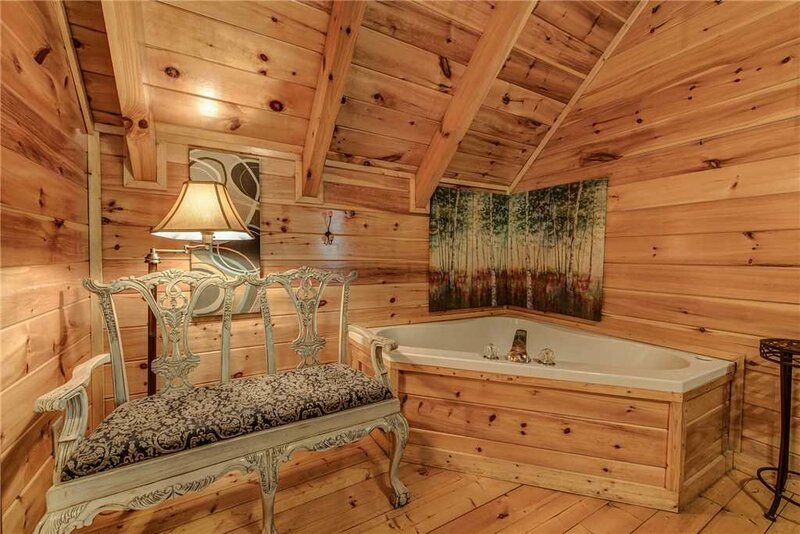 The hot tub also had a disgusting smell. The windows, grill and deck could also use a good cleaning.For the price of the rental I expected more. We will not be staying there again, obviously the photos online were when the cabin was newer. Hi Debbie! Thank you so much for staying with us at Holly Berry. We're sad to hear that there were some cleaning issues that may have gotten missed by our cleaning staff. We wish you had called us on our 24/7/365 guest services phone number that was provided to you in your arrival email. We would have been more than happy to send house keeping by immediately to address any concerns you may have had about the property's cleanliness. The hot tub is drained and cleaned after every single stay. We have seen a few instances where guests were sensitive to the smell of bromine (chemical used in the water similar to chlorine). Following your feedback, we will send someone from our management team by the property to evaluate your feedback and address any and all issues that may exist. Regarding the photos - these photos were taken earlier this year and have not been doctored in anyway - they are a recent and accurate representation of the property. We're sorry you had these issues, and wish you had given us the opportunity to address them for you during your stay. Thank you for staying with us and we would love to host you again in the future. Thanks! 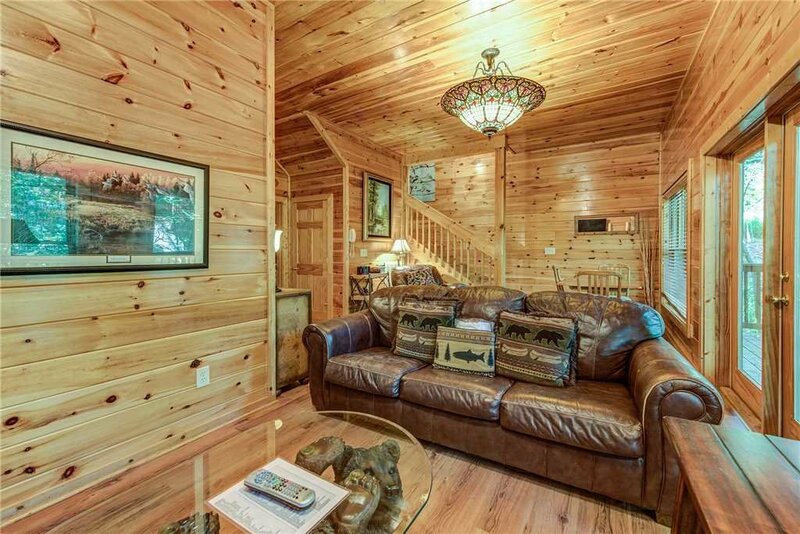 We had a family vacation for Shades of the Past and had a wonderful stay at this cabin. 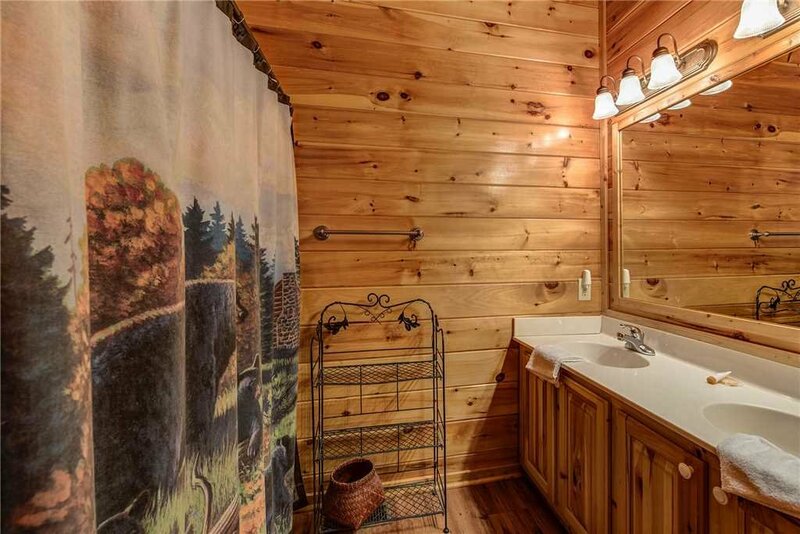 It's extremely clean and convenient to town. We loved staying there and will do it again. Overall we had a nice family vacation at Holly Berry. 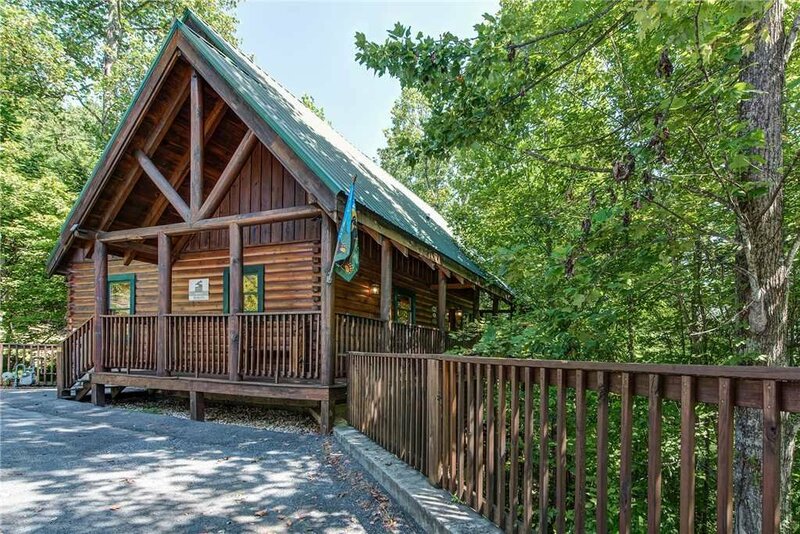 The location was good & the size of the cabin suited our needs. The loft bed mattress desperately needs changed. It sinks to the middle of the bed!! The TV remote for the loft bedroom didn't work either but we borrowed one from another room. We did see bears in the resort! We would most likely stay again as long as the mattress is changed. 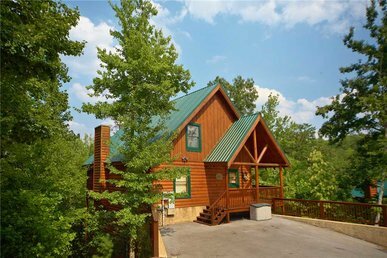 Cabin was very nice, Parking was very good as we had several cars and a large enclosed trailer as well. We had several people and no one had any issues. Our overall stay was very good. Cabin was very clean but someone threw trash off the deck that should have been picked up before we got there. 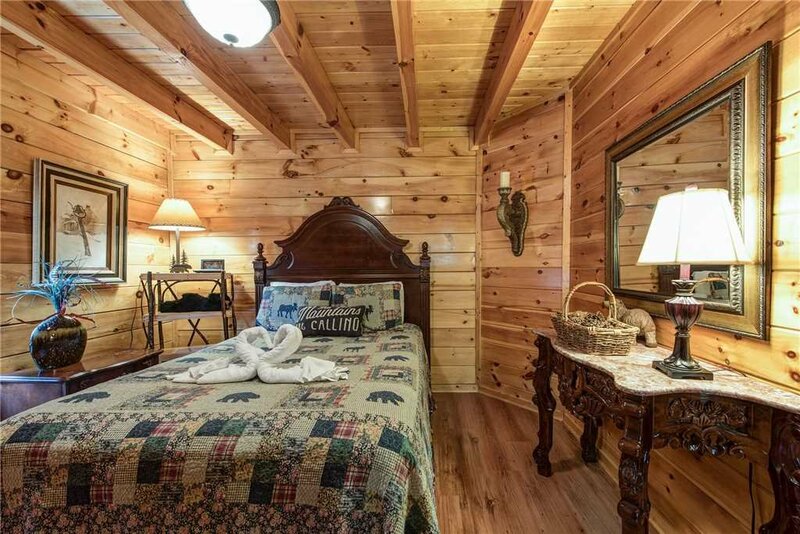 Thank you for the positive review and for saying the cabin was nice and clean! The trash outside was due to a bear that got into some trash up the hill. This occurred after the cleaners left - I'm sorry the trash was there when you arrived! In the future, give us a call and we will send someone right out to pick it up. Thanks again for staying with us and come back soon!